Jane Wells, the lead organizer of WordCamp San Francisco this year, has posted both the shirt designs for next week’s event as well as a bit of background on them. The background is definitely necessary, since the shirt design itself is based—with permission—on an xkcd comic strip. For those that don’t know what xkcd is, stop reading. Seriously, leave this blog. 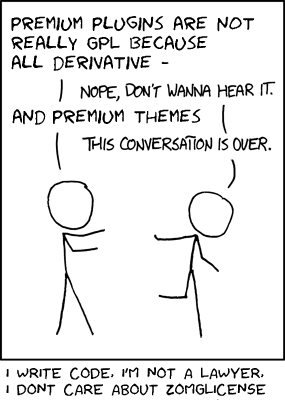 WPCandy is cool and everything, but xkcd is better. Leave. Now. I changed herpetologists and ornithologists to developers and bloggers, and wrote some replacement text. Chelsea Otakan turned the PNG into a vector and used a fan-created font to approximate the look of real xkcd text. Mike Ritchey at High Voltage Productions (formerly Lo-fi Custom), who works with a lot of WordCamps on custom shirt printing, did some adjusting to make sure it would be legible. Those attending WordCamp San Francisco next weekend, all 900 or so of you, will get your open-source-loving mitts on blue shirts with this design on them soon enough. While we wait for that to happen, I just have one question: can you think of a better comic strip to represent the WordPress community? That is so freaking awesome. So glad I am going this year, and will get this shirt! Thanks for sharing the details. Just when I thought I couldn’t feel any sadder that I’m not coming… Would love one of those.